I was very happy to receive a letter thanking me for being a Valued customer. It brought momentary happiness to my day. 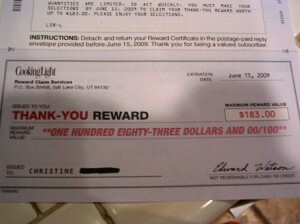 I was even more delighted to see a reward check for a Maximum Value of $183. Woo hoo! A company that believes in their customers. The attached catalog has such great rewards. 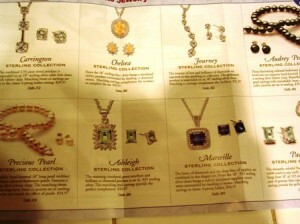 I especially love the Ashleigh amethyst jewelry set or even the Pacific blue topaz set. And my daughter would love to have that first aid kit because she is addicted to Band-aids (she is only 9 yrs old). How fun. All I have to do is “Simply indicate your favorites and return you thank-you reward certificate”. “Individually boxed and wrapped”. How special you make me feel. Well, dear Cooking Light people, you need to realize that I am a personal finance blogger. And us PF bloggers have realized and learned that we really need to read the fine print. So, just as I was to fill out my reward for such lovely gifts… I flipped the letter over. 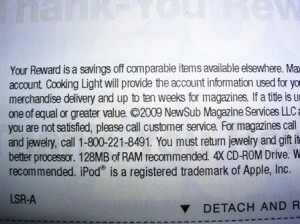 “Your Reward is a saving off comparable items available elsewhere”. Read on I did… The sadder I became. I get nothing for free. You would have charged my credit card with the information your already have tied to my magazine subscription. I am Crushed, dear cooking light. Not only could I have easily been subjected to high charges if I wasn’t a keen personal finance blogger and flipped to read the back. But, because I know many of thousands of other people not keen to reading the fine print will be subjected to paying you lots of money on a Credit Card they can’t afford to have already. America is already in severe financial trouble. And this ploy of yours is devious. If I didn’t love your magazine so much you would easily have lost me as a reader. To My Blog Buddies: Think I should send them the link to this post??? It’s makes me sad that this sort of mailing with scam intent is legal to send to people. This entry was posted in Finances, The Daily Grind on 2009-05-20 by Christine. yep, i say send it. Ugh. 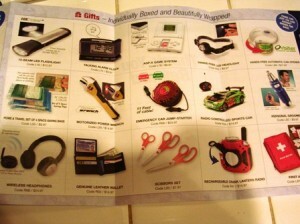 Same kind of scams that credit cards include in their inserts. Good job on reading the fine print. And when did you start talking like Yoda? @ Ms Money Chat: I think so. Perhaps they will shower me with years worth of Subscriptions. LOL. That is just really horrible that they can do such a thing. To think I almost fell for it. Got to excited over the glitz! Send the link on, say I. Do them good to know people are on to them, it would. Go figure….glad you were able to discover their “plot”….